Place the sliced shallots in a large bowl. In a saucepan, combine the water, sugar, champagne vinegar, yellow mustard seeds, anise seeds, and juniper berries. Bring the pickling liquid to a simmer over medium heat. Pour the liquid over the shallots. Press the shallots down so they are submerged. Let sit for at least 30 minutes. Use with the salmon cakes and reserve the rest (in the liquid) in the fridge for another use. Preheat the oven to 375°F. Place the whole salmon filet, skin side down, on a foil-lined sheet pan. Drizzle with olive oil and season with a pinch of salt. Bake the fish for 10 minutes (the salmon should be just cooked, if not slightly underdone, so that when you cook it again for the salmon cakes it won’t be dry). Let cool slightly. Use two forks to flake apart the salmon meat. Discard the skin and set aside. Add the rye bread to a food processor. Pulse until slightly course breadcrumbs form. You want to end up with about 1 ½ cups of breadcrumbs. Set aside. In a mixing bowl, whisk together the egg, greek yogurt, dijon mustard, hot sauce, and salt until smooth. Fold in the salmon, breadcrumbs, fresh dill, and chives. Form the mixture into six, even salmon cakes. Heat a large sauté pan over medium heat. Add enough olive oil to generously coat the bottom of the pan. When the oil is hot, gently place a few of the salmon cakes in the pan (the salmon mixture will be quite wet, so work gently with it as you place it into the pan). Cook the salmon cakes until golden brown and crisp on one side, about 2-3 minutes. Gently flip them over using a spatula and finish cooking through on the other side, another 2-3 minutes. Keep warm while you finish cooking the rest of the salmon cakes. Serve them with the pickled shallots and caper yogurt on top. Garnish with fresh dill, shaved radishes, a few extra capers, a squeeze of lemon juice, and a drizzle of olive oil. 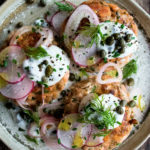 While the salmon cakes cook, whisk together the greek yogurt, lemon juice, and capers. To keep these simpler, you can definitely skip the pickled shallots. They add such a wonderful flavor, but the salmon cakes and caper yogurt are great on their own as well.